60,000 lb capacity industrial-duty axle scale. Especially suited to construction applications and temporary work sites. 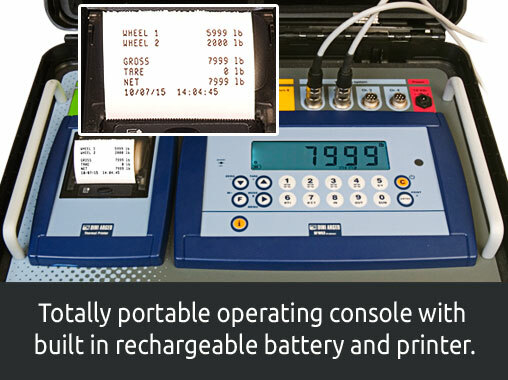 This axle scale features a unique, briefcase-enclosed operating console that includes quick-connect cables, a built in rechargeable battery, digital indicator and receipt printer. The TS60-730AWBC provides economical truck weighing. Typical application of this scale is for verification that trucks and trailers are not overloaded or underloaded. Factory calibrated, ships ready to place into location, bolt on ramps, connect cables and put into use. Includes step-by-step set up instructions. Can be set up on site in less than an hour. Weighing platforms are rated to 200% of capacity. Ramps are easily secured to platforms with single-bolt tabs. Fully epoxy coated surfaces throughout. Also available in four platform and six platform configurations. Floor Scales Direct is the premier online source to find the best prices and selection on axle scales, floor scales and more. Shop the site to get exactly what you need or browse the products and descriptions to learn more about how these industrial scales may improve your operations. Maximize the efficiency of your fleet and avoid costly overload fines with this model. The TS60-730AWBC provides the ability to accurately weigh vehicle axles. 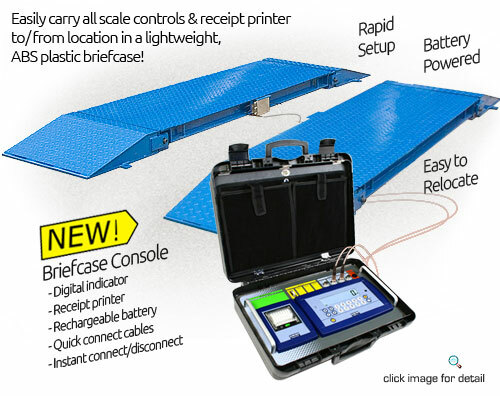 These axle scales have a briefcase-enclosed operating console that includes quick-connect cables, a built in rechargeable battery, digital indicator and receipt printer. The system configuration includes twin weighbridges that are manufactured from high strength, structural steel. Each weighbridge contains four sealed load cells that are proven reliable under adverse operating conditions. There are no moving parts to wear out or adjust, thereby ensuring years of trouble free operation. 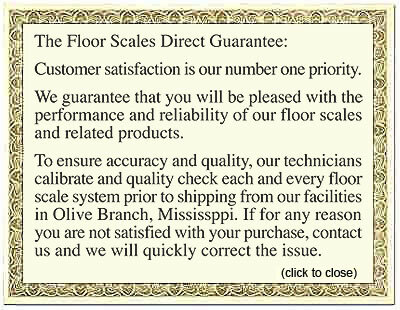 Floor Scales Direct is your best source for all your industrial scale needs. Shop here and return often for all the resources you may need.